Kenneth Mathieson "Kenny" Dalglish (born March 4, 1951) was a Scottish international football player who was born in Glasgow, Scotland. A prolific goal scorer, he was famous for his successes in the 1970s and 1980s, with Glasgow Celtic and with the English club Liverpool, and is widely-regarded as the greatest British player of his generation. More recently, he has also enjoyed success as a club manager: he is one of only a handful of people to have won the English League Championship as a manager with two different clubs. 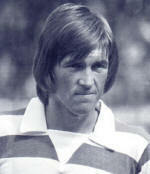 Dalglish built his reputation with Celtic, winning the Scottish Championship in five consecutive seasons in the early 1970s. He then moved to Liverpool in 1977, for a then-record £440,000 transfer fee, to replace Kevin Keegan, who left to play for Hamburg in Germany. In his first season, Dalglish scored the winning goal in the European Cup final, against the Belgian club F.C. Bruges. He went on to become arguably the most influential member of the most successful club team in English football history, winning further League Championships and European Cups in a period stretching to the mid-1980s. After the Heysel Stadium disaster in 1985, in the wake of the resignation of manager Joe Fagin, Dalglish became player-manager of the club; he coached them to their first-ever "double" — winning the League Championship and F.A. Cup in the same season — in his first season, 1985-86. He continued as manager when he retired as a player, winning the League again in 1987/88 and 1989/90, and the F.A Cup in 1988/89. Dalglish was also in charge of the club at the time of the Hillsborough disaster, in the 1989 FA Cup semi-final against Nottingham Forest. He won many admirers for his exemplary dignity during this tragedy, and is still well-regarded by Liverpool supporters for this reason as much as for his on-field successes; ultimately, though, the trauma took its toll on his health, and he resigned as manager of Liverpool in 1991. Dalglish returned to management after a short break, with Blackburn Rovers, whom he led into the English Premiership in his first season. After winning the Premiership in 1995, Dalglish "moved upstairs" to become Director of Football at Blackburn; this was a largely-symbolic role that freed up his time for golf and TV punditry. He parted company with the club at the end of the following season. In Spring 1997 he took control at a third top-flight English club, once again replacing the departing Kevin Keegan, this time as manager of Newcastle United. Despite an initially strong performance, Dalglish's dismantling of one of the most exciting footballing sides in the Premiership lost him the support of the fans, and he was sacked by Newcastle early in the 1997/98 season. His most recent role to date was as Director of Football at Celtic, but he resigned after one disastrous season which saw Celtic knocked out of the Scottish FA Cup by Inverness Caledonian Thistle and finish 21 points behind their arch-rivals Rangers in the Scottish Premier League.